范耘硕, 邵蓬, 贾旭颖, 高金伟, 窦勇, 史谢尧, 周文礼. 温度胁迫对大鳞副泥鳅抗氧化与非特异性免疫指标的影响[J]. 渔业科学进展, 2019, 40(2): 58-64. DOI: 10.19663/j.issn2095-9869.20180306001. FAN Yunshuo, SHAO Peng, JIA Xuying, GAO Jinwei, DOU Yong, SHI Xieyao, ZHOU Wenli. 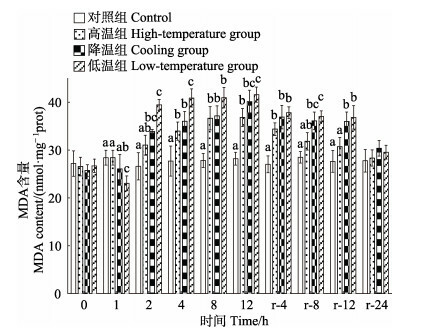 Effects of Temperature Stress on the Partial Antioxidative and Non-Specific Immunity Indices of Paramisgurnus dabryanus[J]. Progress in Fishery Sciences, 2019, 40(2): 58-64. DOI: 10.19663/j.issn2095-9869.20180306001. 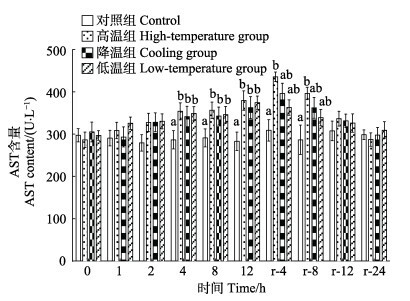 Corresponding author: SHAO Peng, E-mail:vipshaopeng@sohu.com. 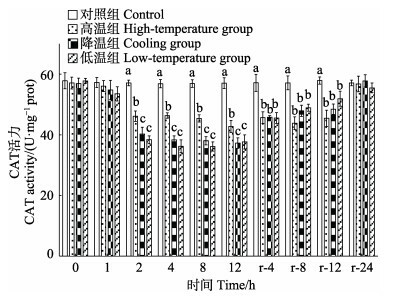 Abstract: To investigate the effect of temperature stress on the antioxidative and nonspecific immune systems of Paramisgurnus dabryanus under transportation conditions, the liver activities of superoxide dismutase (SOD), catalase (CAT), lysozyme (LZM), and alkaline phosphatase (AKP) as well as the malondialdehyde (MDA) content, and the serum content of alanine aminotransferase (ALT) and aspartate transaminase (AST) were determined. The following results were obtained: The activities of SOD and CAT in the liver were significantly lower (P < 0.05), and the MDA content was significantly higher (P < 0.05), than the levels in the control group. 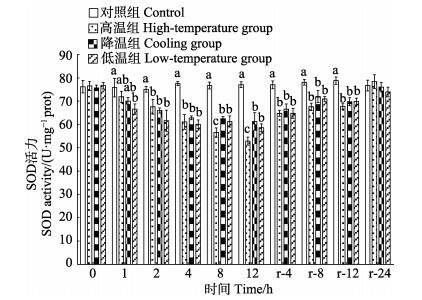 During the recovery period, the activities of the two antioxidative enzymes in each experimental group increased gradually and the MDA content decreased gradually. There was no significant difference between the control group and each experimental group at the end of the recovery period (P > 0.05). The liver activities of LZM and AKP in each experimental group were significantly lower than that of the control group (P < 0.05) at the end of the stress period. During the recovery period, the LZM and AKP activities remained at the stress level at the end of the stress period, whereas their activities in the other experimental groups increased gradually and there was no significant difference (P > 0.05) compared with the control group at the end of the recovery period. The changes in serum AST and ALT content during the stress period were significantly higher than those in the control group (P < 0.05). During the recovery period, the AST and ALT content showed a downward trend until the end of the recovery period. 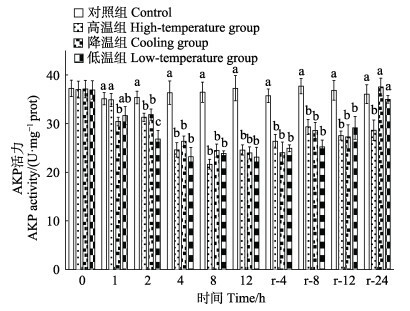 In addition, the ALT content in the high-temperature group dropped to the control group level. 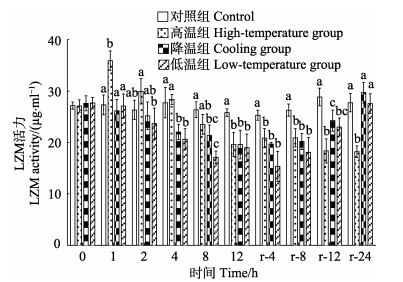 The results showed that temperature stress significantly inhibited the antioxidative capacity and nonspecific immunity of P. dabryanus, where the high-temperature stress caused irreversible damage to the nonspecific immune function of the fish, whereas the other inhibition effects were recoverable.